Lions start spring on the right foot at Red Raider Invite. 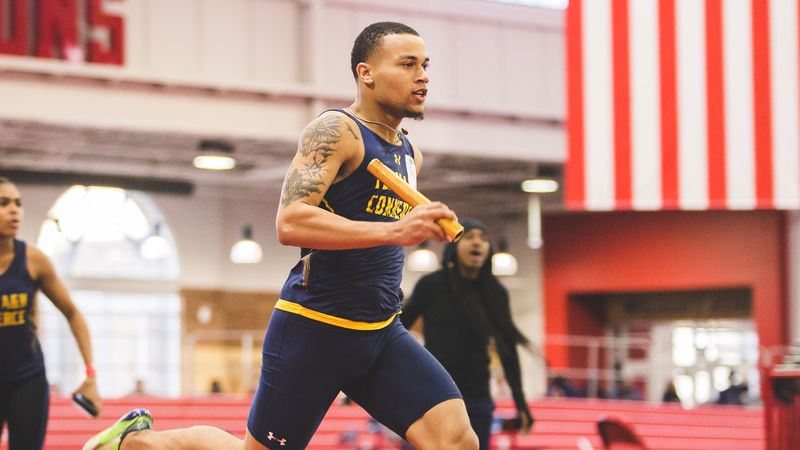 LUBBOCK – The Texas A&M University-Commerce track and field teams got back into the swing of action this weekend at the Texas Tech Red Raider Invite. The highlight of the meet came in the final race as the men’s 4×400 meter relay ran its first race of the second at full strength and put up the third fastest time in the nation. Gabriel Peterson (Lancaster), Xavier Harvey (Dallas-Bishop Dunne), D’Lance Sharp (Commerce), and Rashard Clark (Los Angeles, Calif.) all crossed the line in 3:14.71, which is adjusted to 3:15.15 based on altitude for NCAA qualifying purposes. Minna Svaerd (Karlstad, Sweden) earned a provisional qualifying mark in the women’s pole vault at 3.70 meters (12-1 ½), which is the top mark in the conference so far this season. Other Lions who put up marks that place in the top 50 nationally was newcomer Eboni Coby (Lancaster) in the 200-meter dash, Hailey Wanoreck (Beaumont-Hamshire-Fannett) in the women’s shot put, and Jake Graf (Mount Vernon) in the men’s pole vault. Jordan Wilson’s (Blythewood, Ark.) mark of 6.98m (22-11) in the men’s long jump is tied for second in the Lone Star Conference at this point in the season, while Robert Wood’s (Wylie) mark of 1.96m (6-5) in the men’s high jump and Steven Sanchez’s (New Braunfels) mark of 16.03m (52-7 ¼) in the men’s weight throw rank third in the league. In the women’s meet, Atiana Alexander (San Antonio-Northside Taft) ran a 58.09 in the 400 meter dash to rank third in the conference, the 4×400 relay team of Alexander, Joy Spann (Frisco – Lone Star), Ro’Nisha Simpson (Tatum), and Svaerd ranks second in the LSC at 3:53.41, Mackenzie Clark’s (Garland – Naaman Forest) mark of 5.25m (17-2 ¾) in the long jump ranks third in the conference. The Lions will continue to develop and improve, with three meets remaining before the Lone Star Conference Championships in mid-February. A&M-Commerce heads to Pittsburg, Kan., this Saturday, January 26, for the Pittsburg State Invitational at the home of the NCAA Division II National Championships. No. 20 Lions overcome 19-point first half deficit to defeat ENMU 112-99. .PORTALES, N.M.– The No. 20 Texas A&M University-Commerce men’s basketball team defeated Eastern New Mexico 112-99 on the road on Saturday afternoon. The Lions got behind early in the game but were able to tie the game at halftime and pull away in the second half. The win brings the Lions to 14-3 and 6-1 in the Lone Star Conference. The Greyhounds fall to 7-9 and 4-4 in conference play. The Lions return home to host Western New Mexico on Thursday. The game will be at 7:30 p.m. at the Field House, following the Lion women’s basketball team against the Mustangs. Tickets for the doubleheader are available at WeAreLionsTix.com, by calling (903) 468-8756 or by visiting the Lion Sales & Service Box Office in the Field House. – Reggie Reid (Harlem, Ga.) had a triple-double with 16 points, 13 assists, and 12 rebounds. He is the first player in the LSC to have a triple-double this season. – Willie Rooks (Houston – North Forest) scored a season-high 27 points, including eight three-pointers. – Trey Conrod (Kilgore) had 14 points, Deonte Terrell (Chicago, Ill.) had 12 points and Carson Tuttle (Mukilteo, Wash.) and Srdan Budimir (Karadjordjevo, Servia) each had 11 points. – The Lions shot 50 percent from the field in the game and made 49 percent of their three-pointers (20-for-41). – ENMU played the final 31 minutes of the game with four players available. It was an even beginning to the game as the teams split the first 16 points of the game. After the Lions took the lead, ENMU went on a 10-0 run to establish a lead. The Greyhounds pushed their lead to as many as 17 at the 11-minute mark. The teams traded baskets for several minutes as both sides were hitting shots. With 5:32 remaining in half, ENMU held a 19-point advantage. The Lions then began to storm back, catching fire from beyond the arc. Budimir and Tuttle hit consecutive threes to cut into the lead, and both had another as the Lions cut the lead to just two points. Reid then hit a three with 1:30 remaining in half to give the Lions a lead. After ENMU made a shot, a dunk from Reid gave the Lions back the lead. The Greyhounds made a shot in the final seconds to send the game into halftime tied at 53. Reid, Conrod, and Budimir all had eight points in the first half. The Lions shot 42 percent in half and shot 46 percent from behind the arc. The teams traded baskets early in the second half before the Lions took the lead for good on a three from Rooks. Rooks caught fire in the second half, hitting six threes in half. Reid also hit a three and the Lions took a double-digit lead with 13:34 left to play. For the next four minutes, the Lions maintained their double-figure lead before pushing their lead even further. The Greyhounds cut the Lion lead down to 12 points late, but A&M-Commerce left with the win. 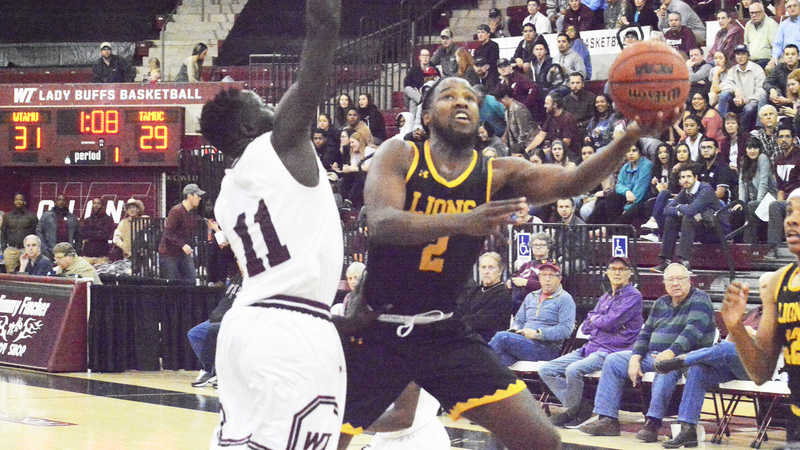 Lions up and down in 90-79 loss to Eastern New Mexico. 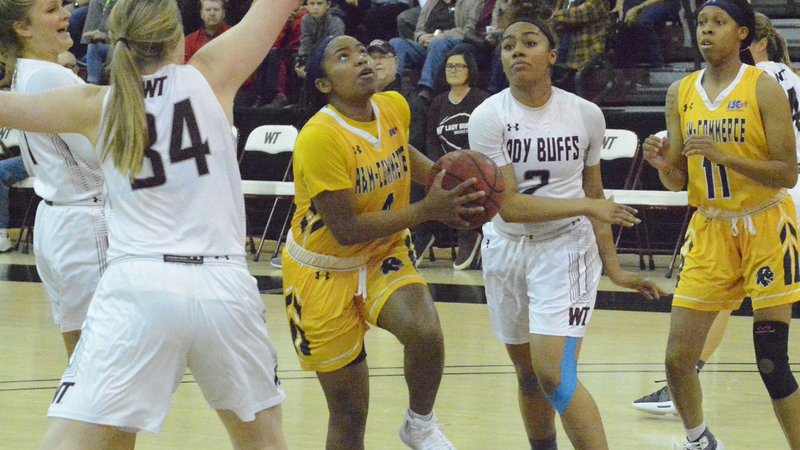 PORTALES, N.M.– The Texas A&M University-Commerce women’s basketball team lost to Eastern New Mexico 90-79 on the road on Saturday afternoon. The Lions got off to a cold start from the field and could not mount a comeback. The loss brings the Lions to 10-6 and 5-3 in the Lone Star Conference. The Greyhounds improve to 12-4 and 7-1 in conference play. The Lions return home to host Western New Mexico on Thursday. The game will be played at 5:30 p.m. at the Field House, followed by the Lion men’s basketball team against the Mustangs. Tickets for the doubleheader are available at WeAreLionsTix.com, by calling (903) 468-8756 or by visiting the Lion Sales & Service Box Office in the Field House. – Princess Davis (Shreveport, La.) led the Lions with 17 points, all of which came in the second half. She also had five rebounds and led the team with four assists. – Chania Wright (DeSoto) had 15 points while Maddison Glass (Missouri City – Hightower) had 13 points. Makayla Foy (Edmond, Okla.) also scored in double figures with 11 points. – The Lions shot 29 percent from the field in the game while ENMU shot 43 percent. – ENMU shot 44 free throws while the Lions shot 30 free throws. There were 51 foul calls in the game. – The Lions had just eight turnovers in the game while ENMU had 19. The Lions scored 21 points off of turnovers. The Greyhounds came out firing right out of the gate, scoring the first 10 points of the game and ENMU jumped out to an early 15-2 lead. The Lion offense was sparked by Foy, who hit a three-pointer and also had a fast break bucket as the Lions went on an 8-0 run of their own to cut ENMU’s lead to five. The Lions cut the lead to four points in the final minute, and ENMU took a 20-14 lead into the second quarter. The Greyhounds again started on a tear to start the second, scoring the first eight points of the quarter to take a 28-14 lead. The Lions went on a 6-0 run of their own to close the gap. ENMU finished the quarter well as the Lions continued to struggle from the field. Going into the half, ENMU held a 37-25 lead. Foy led the Lions with eight points while Glass had seven. The Lions shot just 21 percent in the first half while ENMU shot 41 percent, including 5-of-10 from long range. The Lions were helped by eight ENMU turnovers, which resulted in nine points. The teams traded baskets early in the third quarter before the Greyhounds again went on a run. This time it was a 12-1 run as the Greyhounds got to the free throw line. With four minutes to play in the quarter, the Greyhounds led by 22. The Lions then started a rally. Free throws aided the Lion cause, and Davis also had a three-point play. The Lions were able to cut the ENMU lead to 12 points before two quick ENMU baskets sent the Lions into the fourth quarter trailing 62-46. The Lions hit two early threes as they cut the ENMU lead to just 11 points. The Greyhounds responded, and the edge was back to 20 points with five minutes remaining. The Lions would not quit and wound up cutting the ENMU lead to just nine points with less than a minute remaining. But the Greyhounds closed out the game to get the win. Michael Onuoha to represent A&M-Commerce in Saturday’s NFLPA Collegiate Bowl. 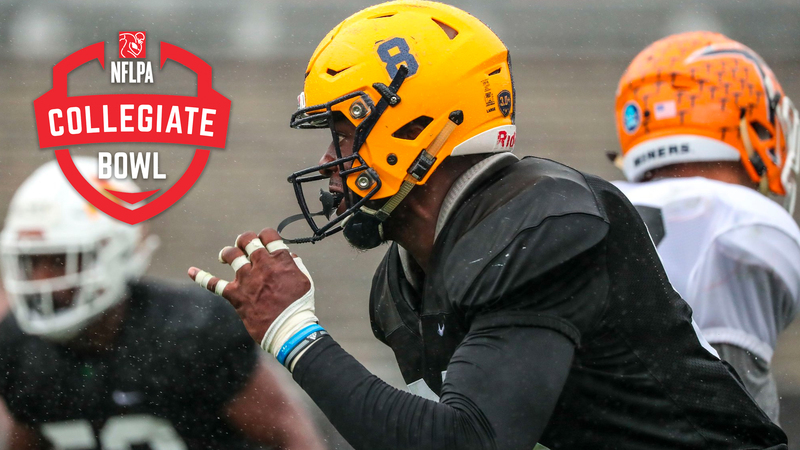 PASADENA, Calif. – Texas A&M University-Commerce defensive end Michael Onuoha will represent the Lions in the 2019 NFLPA Collegiate Bowl, which will be played Saturday, January 19, in the historic Rose Bowl. The game will kick off at 4 p.m. CST and will be televised nationally on FS1. Onuoha (Edmond, Okla. – Santa Fe) will play on the American Team, which will be coached by former Indianapolis Colts head coach Chuck Pagano. Onuoha’s participation in the game marks the second consecutive year the Lions have been represented in the NFLPA Collegiate Bowl, following in the footsteps of Harlon Hill Trophy-winning quarterback Luis Perez in the 2018 game. Onuoha is a two-time All-American at A&M-Commerce, recently earning First Team All-American honors from D2Football.com. In the 2018 season, Onuoha had 47 tackles with 14.5 tackles for loss, 6.5 sacks, an interception, a blocked kick, and 10 quarterback hurries. He finished fifth in the LSC in tackles for loss and tied for second in the LSC in sacks. In 38 games in a Lion uniform, Onuoha made 137 total tackles with 32 tackles for loss and 14 sacks with two forced fumbles. He ranks sixth in program history in tackles for loss. No. 20 Lions suffer first LSC defeat with an 87-66 road loss to No. 16 West Texas A&M. CANYON– The No. 20 Texas A&M University-Commerce men’s basketball team lost 87-66 against No. 16 West Texas A&M on Thursday night. The Lions held the lead with 10 minutes remaining in the game before WT ran away in the final 10 minutes. The loss brings the Lions to 13-3 on the season and 5-1 in the Lone Star Conference. The Buffs improve to 17-3 and 6-1 in LSC play. The Lions return to action on Saturday with a road game against Eastern New Mexico. The game will be played at 5 p.m. CST at Greyhound Arena in Portales, N.M.
– Reggie Reid (Harlem, Ga.) led the team with 22 points and added six rebounds. – Tyree Robinson (Fall River, Mass.) added 16 points in just 13 minutes, being limited in foul trouble. He went 7-for-8 from the field. – Willie Rooks (Houston – North Forest) also scored in double figures with 10 points and led the team with eight rebounds. – The Lions shot 36 percent while WT shot 51 percent in the game. The Buffs shot 62 percent in the second half. – There were six lead changes in the game before WT took the lead for good with under 10 minutes to play. – WT scored 25 points off of 14 Lion turnovers. WT had eight turnovers in the game. After WT made the first shot of the game, the Lions went on a quick 7-0 run to take the lead. A three from Reid gave the Lions a 10-4 lead after six minutes of play. Robinson was able to get multiple looks in the paint, getting a dunk and a layup three-point play. With 12 minutes to play, the Lions held a 15-8 lead. The Buffs then went on a run, hitting two threes to cut the Lion lead to one point with nine minutes to play. Robinson made two more baskets in the paint to bring the Lion lead back up. WT battled back to again cut into the lead and at the four-minute mark, a three gave WT the lead back. The edge would change hands several times late in the half as both teams battled on both ends of the floor. After two consecutive buckets from WT, the Lions hit a late three to go into the half behind 34-32. Robinson led all scorers with 11 points in the half, making all five of his shots. Reid added 10 points, and Rooks had six rebounds to lead the Lions on the boards. Both teams shot nearly identical from the field. The Buffs got to the foul line eight times in the half compared to just three foul shots for the Lions. The Lions tied the game early in the second half on a layup from Robinson. The teams battled back and forth early before a 9-0 run by WT put them ahead 49-40 with 15 minutes remaining. The Lions would rally back, going on a 15-2 run to take the lead. Reid led the rally, scoring eight points, including a three-point play. The Lions held a 57-53 lead midway through the half. It was almost all WT in the final 10 minutes as they outscored the Lions 34-9 in the last minutes. Late comeback attempt falls short as Lions fall 81-70 to No. 8 West Texas A&M. 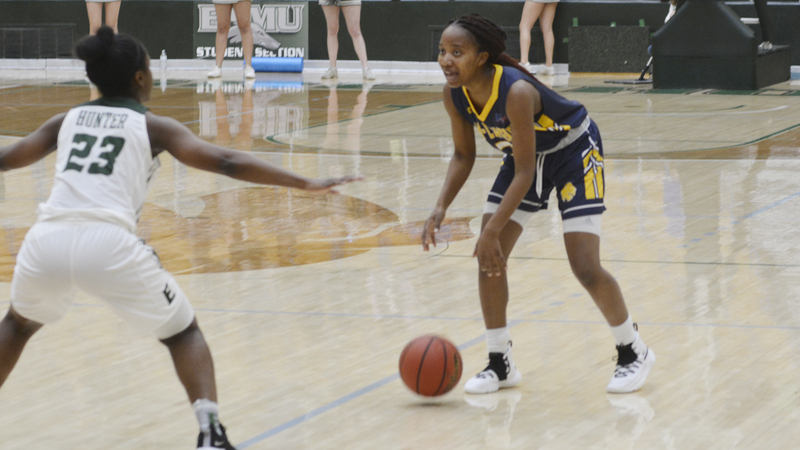 CANYON– The Texas A&M University-Commerce women’s basketball team lost 81-70 to No. 8 West Texas A&M on Thursday night. The Lady Buffs built a lead in the third quarter, and a late run by the Lions came up short. The loss brings the Lions to 10-5 on the season and 5-2 in the Lone Star Conference and snaps a seven-game win streak for A&M-Commerce. WT improves to 14-1 and 6-1 in conference play. The Lions return to action on Saturday with a road game against Eastern New Mexico. The game will be played at 3 p.m. CST at Greyhound Arena in Portales, N.M.
– Chania Wright (DeSoto) led the Lions with 13 points, shooting 5-for-13 from the field. – Maddison Glass (Missouri City – Hightower) had 10 points, and Alexus Jones (Lewisville – Aledo) also had 10 points. – The Lions shot 38 percent from the field while WT shot 53 percent. The Lions missed 13 free throws in the contest. – After trailing by as many as 24 in the fourth, the Lions cut the WT lead to just 10 points in the final minute. The Lions scored the first basket of the game before the Lady Buffs scored six points in a row to take the lead. Tac had the hot hand early for the Lions, scoring seven points in the quarter. Midway through the quarter, the Lions trailed 12-8. The lead stayed around four points before a late run by WT sent the Lions into the second quarter trailing 20-13. Early in the quarter, WT pushed its lead to double figures. The Lions continued to battle, cutting the edge back down to seven points. Turnovers plagued both teams in the second quarter, with neither team able to gain much ground. Glass hit a three-pointer at the buzzer to send A&M-Commerce into halftime trailing 38-31. Tac and Glass both had seven points in the first half. The Lions shot 38 percent in the half while WT shot 54 percent. The Lions had seven offensive rebounds in half. The Lions struggled from the line, going 3-for-9 in the first half. The Lions cut the WT lead to six points early in the third quarter before WT went on a 10-0 run to take their largest lead of the game. WT continued to build its lead, taking a 61-41 lead into the fourth quarter. After trailing by 23 in the quarter, the Lions went on a late run to cut the Lady Buff lead in half. The Lion bench capitalized on several WT turnovers. Glass made an and-one, and Delyssa Miller got to the foul line four times to cut into the lead. However, the Lions could not overcome the WT lead. Bailiff rounds out Lion Football coaching staff. 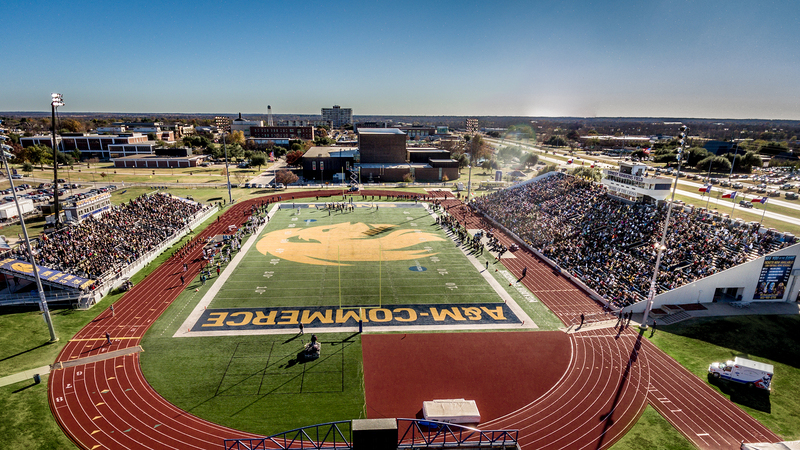 COMMERCE – Texas A&M University-Commerce head football coach David Bailiff has announced the completion of his full-time coaching staff, as the Lions begin preparations for the 2019 season. The offense will be led by offensive coordinator Billy Riebock, with Famika Anae coaching the offensive line. Wide receivers coach Yogi Gallegos and running backs coach Tim Bleil will return from the 2018 staff. The defense will be led by defensive coordinator Xavier Adibi, with Casey Walker coaching the defensive line, Willie Mack Garza coaching the defensive backs, and Jaylon Finner coaching the safeties. Joey Caldwell rounds out the staff, joining Lion Athletics as the senior director of sports performance. “We had our first team meeting with the full staff on Sunday, and it’s exciting,” Bailiff said. “The building had been mostly empty during the holidays, and it’s exciting to hear the chatter of the young men. It’s a special time when they come back. They have high expectations, and we talked in that meeting about how quickly we have to trust each other to keep the momentum going. Offensive coordinator Billy Riebock was the offensive coordinator at Bridgewater (Va.) College in 2018. The Eagles ranked fifth nationally in Division III in red zone offense and had three offensive all-ODAC picks and two offensive all-state selections. Riebock coached for Bailiff at Rice in 2017 after spending the previous three seasons as the wide receivers coach at Elon. Defensive coordinator Xavier Adibi was a defensive analyst at Arkansas in the 2018 season and previously worked as a scout and analyst on Baliff’s staff at Rice. Adibi was a college standout at Virginia Tech, earning first-team AFCA All-American and first-team All-ACC honors in 2007, after receiving second-team All-ACC honors in 2006. He was drafted by the Houston Texans in the fourth round of the 2008 NFL Draft and had a five-year NFL career, playing for Houston, Minnesota, Chicago, and Tennessee. Texas football legend and long-time collegiate coach Willie Mack Garza brings 18 years of coaching experience with him to the Lion staff. He was the defensive backs coach at Dixie State in 2017 after serving as the secondary coach at Lamar in 2016, and linebackers coach and special teams coordinator at Prairie View A&M in 2015. Before his stop at Prairie View, Garza spent two seasons at Pearl River Community College where he served as the team’s defensive coordinator. He was defensive backs coach at the University of Southern California under former head coach Lane Kiffin for one season in 2010. Before his stint at USC, Garza spent 2009 as the defensive backs coach at Tennessee also under Kiffin. He spent four years (2005-09) at North Dakota State as the secondary coach for one season and the defensive coordinator in his final three. He was the defensive backs coach at TCU from 2001-03 and Western Michigan from 1997-2000 after beginning his coaching career as a graduate assistant at Texas from 1994-96. Garza is a member of the Texas High School Hall of Fame after his stellar prep career at Refugio High School where he earned Parade All-American, All-State, and All-Decade (1980-1990) honors on the gridiron. He was a four-year starter at cornerback and safety at Texas and was a Freshman All-American and the Southwest Conference Newcomer of the Year in 1988. The Longhorns went 10-2 and played in the Cotton Bowl in 1990. Jaylon Finner joins the Lion staff after serving as a graduate assistant at Ball State in 2018 and at Rice from 2016-18. He played defensive back for Rice from 2011-15 and helped the Owls win the 2013 Conference USA championship, marking the team’s first league title in 54 years. He played on three consecutive bowl teams (2012, 2013, 2014) under head coach David Bailiff. Famika Anae served as the tight ends coach at Dixie State in the 2018 season. Before DSU, Anae served three seasons as a graduate assistant at Virginia, where his father, Robert, currently helps as offensive coordinator. Anae played three seasons at BYU (2010-12) before his career was cut short due to injuries. Afterward, Anae stayed involved with the program as an undergraduate assistant and graduated from BYU in 2015. Casey Walker also brings experience from across multiple levels of football to the Lion staff. A member of the Super Bowl XLIX champion New England Patriots, Walker, served at Oklahoma Baptist in 2018 as defensive line coach after a year of coaching at Garden City Community College and Central Oklahoma. The Garland native played for four years at Oklahoma before a four-year NFL career. Tim Bleil will serve as running backs and tight ends coach for the Lions for the fourth season. He has coached numerous all-LSC and All-American players in his time in Commerce. Yogi Gallegos will enter his seventh season as a coach at A&M-Commerce, and has coached the explosive receiver group since the 2016 season. He has served as the Lions’ recruiting coordinator for the last few seasons and has been at Commerce since 2011, having played quarterback for two seasons before beginning his coaching career. Joey Caldwell was most recently the co-lead assistant strength and conditioning coach at Rice University. He began at Rice as an intern under Kevin Yoxall in 2014 and has also worked under Ryan Tedford. He also interned under Yoxall at Auburn from 2012-13 following a four-year playing career for the Tigers, where he was a linebacker on the 2010 BCS National Championship team. 132 Lions named to Fall 2018 LSC Commissioner’s Honor Roll. 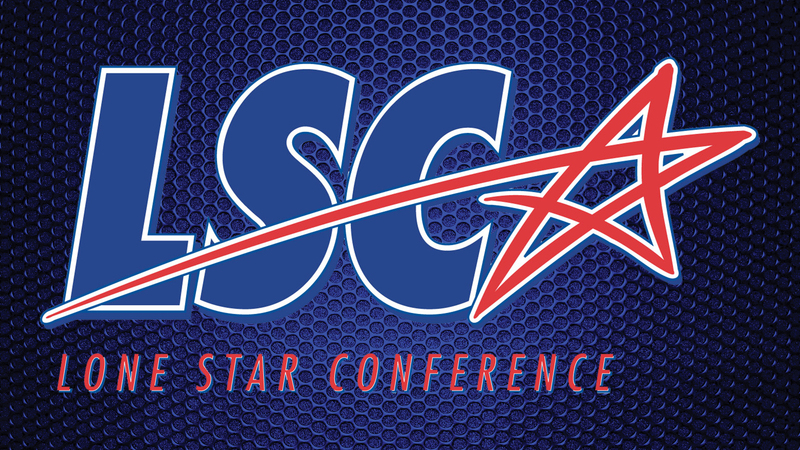 RICHARDSON – Texas A&M University-Commerce is represented by 132 student-athletes on the Fall 2018 Lone Star Conference Commissioner’s Honor Roll, as announced by the LSC office Thursday. The Commissioner’s Honor Roll is announced at the conclusion of the fall and spring semesters with student-athletes qualifying based on grade point average for the current semester. Student-athletes must have a minimum 3.30 GPA for the current semester and be on the roster for honor roll eligibility. Of the 132 Lion student-athletes on the Commissioner’s Honor Roll, A&M-Commerce had 42 student-athletes who earned a perfect 4.0 term grade point average. A total of 1,237 student-athletes throughout the league’s 11 institutions earned recognition on the Commissioner’s Honor Roll. Kara Blasingame So. Soccer Management Oswego, Ill.
Princess Davis Sr. Women’s Basketball Counseling Shreveport, La. Paige-Lee Garris So. Women’s Golf Political Science West Palm Beach, Fla.
Preston Lienemann Sr. Volleyball Public Health Loveland, Colo.
Dallas Millin So. Men’s Golf Finance Wright, Wyo.